I think most everyone realizes we aren’t updating the site as often as last year. With Isaiah getting older and therapies increasing, it’s been tougher to take care of the TFF updates. Michelle and her team at OFM have been super busy with Noah Galloway at Dancing with the Stars. This means my gorgeous wife has been super busy along with Kellie Nelson of OFM who runs our Foundation. I’m going to cover everything from golf to my scripture focus in the update. Golf wise, it’s continued to be a frustrating yet rewarding year. The rewarding part has been the results of the hard work we’ve put in. Webb has shown up every day ready to work and improve. We are currently ranked 3rd on the PGA Tour in Strokes Gained Ball Striking and 3rd in all stats combined. A lot of people don’t realize that Webb’s strength the last 5 years has been ball striking. His worst year statistically ball striking wise has been in the mid 30’s on Tour. We continue to see improvement mechanically, which is showing up on the golf course in a big way. At Webb’s home course during the Wells Fargo Championship, we finished 2nd to world #1 Rory McIlroy. Webb was the only player in top 10 who was negative in strokes gained. That means he finished 2nd despite his putting. It was impressive to see Webb go toe to toe with the world #1 from tee to green!! The frustrating part of the year has been the putting. As most of you know, Webb ditched the long putter one year early to beat the USGA ban starting in 2016. He has worked hard but we haven’t gotten the results we’d hoped for. We are currently 176th in putting after finishing in the top 15 last year. I truly believe we will putt well the rest of the year. It’s tough sometime to stay patient waiting for the results. Our schedule the rest of the PGA Tour season is pretty well set. We return to action for St. Jude and The U.S. Open. Then Greenbrier, British Open and then two more weeks off. Once the WGC at Firestone comes around, it’ll get very busy. We will play 7 out of 8 weeks concluding with the Tour Championship (Lord willing!). On a personal note, our family has started wearing Survival Straps. Survival Straps is a local company we are thrilled to support. They make a bunch of wearable accessories that help the body and are potentially life-saving. The most improved member of the household is actually Hitch (our Weimaraner). He has really spruced up and started eating and drinking more since he started wearing his Survival Strap collar. It’s helped my joint pain and muscle stiffness and I made my 1st hole in 25 years (4th total) the day after I started wearing my bracelet. No, we don’t get paid by Survival Straps – but they do send a portion of the purchase price back to our Foundation (thanks Kurt Walchle!) for every purchase made through our special page (CLICK HERE) or when you use the code TESORI at check out! Huge thanks to all our friends and family who’ve already bought, especially our foundation friend Bob who ordered all the way from Europe! Besides all the normal colds and allergies that all babies go through, Isaiah is doing great. He’s taught me so much in the 1st 16 months of his life. Isaiah has shown me how true John 9:1-3 is. Jesus tells us that every physical or mental flaw is a gift from God that is to be used to glorify our Father. I’m so fortunate to be Isaiah’s Daddio!!! One Scripture that Michelle and I have begun to focus on is Romans 12:2. 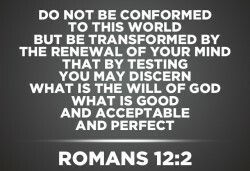 “Do not conform to the pattern of this world, but be transformed by the renewing of your mind. Then you will be able to test and approve what God’s will is—his good, pleasing and perfect will. (Romans 12:2 NIV)”. I love the premise of the passage. It’s so easy to start trying to live your life to conform to this world. Trying to rise in the world golf rankings or trying to to get a promotion at work can take your eyes away from the King. I’ve tried to wake up every morning reading my vows and trying to accomplish them daily. The interesting thing is that our wedding vows are starlight from God and are His commands! It’s so freeing to live life according to The Bible. How about treating others similarly to our wedding vows?! I’ve started one fun thing this year that has been very rewarding. When I think of someone who I’m thankful for, I call them, send them a text or email telling them how much they mean and have meant to me. We think about others with thankful hearts all the time, why not tell them. Let me hear some success stories if you try this in your own life. God Bless and let us know any prayer requests.